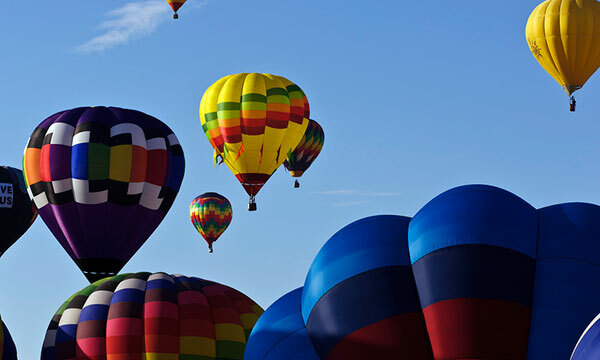 We mentioned the Albuquerque International Balloon Festival last week, and the festival has finally taken off. In celebration, we have one more colorful shot to share. Would you travel to New Mexico for an event like this? If you are a fan of carnival rides, history, or just good old-fashioned summer fun, take a ferry out to NYC’s Governor’s Island this summer for a festival of vintage Parisian rides and carousels. Billed as a museum meets amusement park, Fete Paradiso will open on July 13 and run until September 29, and feature 19th- and 20th-century attractions such as a pipe organ, flying swings and a bicycle carousel like the one featured in “Midnight in Paris.” To add to the vintage French feel, there will be food from bistro Le Gamin and a beer hall and event space converted from a 1900 bumper car pavilion, along with special events opening weekend for Bastille Day. Admission to Fete Paradiso is free and rides are $3 a pop. The free ferry to Governor’s Island from Manhattan‘s Battery Maritime building or Brooklyn‘s Pier 6 runs half-hourly until 7 p.m. every Saturday and Sunday. Learn more about Governor’s Island on their website, and follow the carnival set up on Instagram here. On May 17, a good chunk of East Asia had a day off to celebrate the Buddha’s birthday (Southeast Asia will celebrate it next week). It happens that in Hong Kong the Enlightened One’s birthday coincides each year with a Taoist celebration called the Bun Festival. The culmination of the Bun Festival occurs at midnight of the eighth day of the fourth lunar month, when “bun snatchers” climb a 60-foot tower of buns and collect as many buns as will fit in their bun sack. Yes, buns. Those doughy things you eat. The Bun Festival has roots in the Taoist “Jiao” festivals, where communities pay homage to deities in order to foster peace in the coming year. The origins of the Bun Festival itself are vague. The common and possibly apocryphal story is that offerings were made to Pak Tai, the God of the Sea, in order to protect island villagers from pirates. Another history says it began during the days of Hong Kong’s bubonic plague epidemic, when Pak Tai again was asked for relief from the disease. These Taoist Jiao festivals were apparently widespread before Mao-era suppression brought most religious activities to a screeching halt on the mainland. But the Bun Festival carried on unabated in Hong Kong – that is, until the late ’70s, when tragedy struck. The new bun towers (lit. translation: “bun mountains”) are steel-reinforced and authorities only allow harnessed, elite bun snatchers to climb them. The old bun towers, pictured above, are traditionally made with a bamboo frame. And in the ’70s and before, there were no harnesses – and no limits on the climbers. A mass of men would swarm at the towers, sometimes shimmying up the inside and bursting through the top, all trying to retrieve the top bun: the bun that conferred the most honor on the bun snatcher’s family; the luckiest bun. In 1978, one of the towers collapsed. One hundred people were injured and bureaucrats went into action, canceling the festival. It was only revived 27 years later, in 2005, with strict safety measures in place including limiting the number of climbers to 12. Locals complain that the festival has lost its authenticity because the towers are not a death trap and therefore less thrilling. Personally, I agree with this assessment – things are naturally edgier and more exciting when life is on the line. But I would contend, and I think Competitor #2 (in the pink shirt) in the following video will surely agree, that not all changes have been for the worse. A note on geography: Cheng Chau, where the BF is held, is one of Hong Kong’s Outlying Islands, which generally see far fewer tourists than Victoria Harbour and her famous skyline of hill-scrambling skyscrapers. So when a festival like this comes along, with its quirky competition and photo-op whimsy, it’s almost bound to be exploited to full effect, which it is. A friend and I arrived with half of Hong Kong on a 30-minute fast ferry from Pier 5 in Central, but the other half of Hong Kong was already there. Spectators were stacked 20+ deep beside the cramped main street for the 2 o’clock start of the Parade-In-The-Air, arguably the most entertaining part of the festival. With a bit of a squeeze, we managed to get within tiptoe viewing distance of the procession, and at that moment it began to rain, so we only saw umbrellas for the next quarter hour. When the sun returned, so did our view, and the first thing that paraded into sight was a small child hovering above the heads of the onlookers, being borne precariously down the street atop a vertical column of bowls and plates. The poor kid looked pretty miserable. After the rain stopped and the sun came out, the temperature soared. You’d be miserable, too – the parade lasts two hours and they’re heavily costumed as figures from Chinese history and mythology and perched (or rather hung up by wire frames) atop a sculpture of some sort. One child was dressed in a finely tailored suit, standing on a sword. I have to wonder about the symbolism of that. On the other hand, a few kids looked genuinely thrilled, as below. Overall, the effect is quite enjoyable. The little human statues are interspersed with loud drums and dancing dragons and lions and flag bearers. The crowd is as photographically enthusiastic as anywhere else in China, with generous and effusive “ooos” and “ahhs” for the suffering children. Again, I have to wonder what famous figure this was. As night fell, the elderly locals assembled at a stage between the towers and the Pak Tai temple to watch a Cantonese opera. However, unlike the spectators at the parade, the opera performers’ pentatonic dissonance was appreciated more contemplatively than vocally. Meanwhile the other side of the island is all day a far quieter place, well enough away from the crowd control barriers and bun sellers. There are several sand beaches, and the eastern cove is actually a great windsurfing venue (it’s home to Hong Kong’s only Olympic gold medalist – a windsurfer). A stone path takes you out beyond the beaches to some rock formations on the self-described “Mini Great Wall,” which is actually no more than the stone path you’re walking on. The views are terrific, though, overlooking the cargo ship-spotted West Lamma Channel to Hong Kong, Lamma and Lantau Islands. It’s all quite peaceful by the rocky shore, the surf swishing gently over the stones and little scuttling crabs fleeing every which way. So much so that despite the sunset being on the opposite side, we – and many other crowd refugees – chose to linger a little longer before diving back into the madness of the bun tower crowds, who had already staked a place in the ticket queue for a viewing spot beneath the tower.